Q: How is your window cleaning Forestdale going to restore the clarity of my panes? In-house window wiping – The experts will scrub dirt with ladders and squeegees. Q: Can you wash my casements during bad weather? A: If you spot gloomy clouds on the day of your session, don't panic. The window cleaners in Forestdale can still carry out the service as long as they're facing a light rain. However, in the event of a rainstorm, we will kindly ask you to put off your appointment to avoid any accidents. A: Yes, you can! The washing team will require a unoccupied parking spot in close proximity to your premises (30 metres or less) and on the same side of your windows. A: It's no problem for the specialists to rinse the outside surfaces of your glass façade as long as they are free to enter through your front gates. And if smudges have landed on your internal surfaces as well, just tell us and we'll perform a free key pick-up and delivery. A: We will promptly inform you about the cause of the specialist's delay and notify you once he appears near your building. A: Yes we're qualified to clean any type of casement or window part. 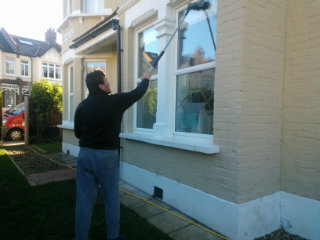 What's more, every PVC or UPVC frame or ledge will be cleaned free of charge! With our window cleaning in Forestdale, you get a meticulous rinse of your sash windows, skylights, glass roofs, French doors, and other glass surfaces at modest rates. We will even provide you with a free polish of all PVC & UPVC frames and sills! For a full list of our prices, please view our price table below. No matter where your stains have taken shelter, our efficient window cleaning in Forestdale will eliminate them with ease. We have encompassed various cleaning methods. Our exterior window wipe is designed for premises with no more than four storeys. To let the daylight back inside, the window cleaners in Forestdale will arrive in a vehicle, outfitted with a retractable water-fed rod. This equipment is attached to a water storage, filled with distilled water. After being released as a powerful gush from the pole's brush-head attachment, the liquid will dissolve all dust build-up in an attempt to renew its original structure. To get to muddy window corners of lofty properties, we'll send a proven team for rope access window cleaning. These licensed abseilers will use well-maintained ropes and harnesses or deploy ladders and cherry pickers to renew the appeal of your panes. We've got all essential COSHH documentation in place and follow each and every safety requirement. To make the in-house surface of your window façade just as shiny, the technicians will depend on the ordinary ladder and squeegee washing approach. As we obtained more and more positive responses from our customers, the need for window cleaning in Forestdale has noticeably skyrocketed in neighbouring areas. You can go over the regions we've included in the list below. Alternatively, get a free instant quote or order affordable window cleaning services Forestdale CR0 online, through our web site.